New Promise Neighborhood Director Sonya Pryor-Jones. Photo courtesy Sisters of Charity Foundation. Photo by Mckinley Wiley. The Cleveland Central Promise Neighborhood, a local initiative focused on improving schools and educational opportunities for children from cradle to college to career, will be headed by Cleveland native Sonya Pryor-Jones. Pryor-Jones, a graduate from Cleveland schools, officially started as director on June 18, and, with the Sisters of Charity Foundation of Cleveland, will help grow the Promise Neighborhood initiative. The Cleveland Central Promise Neighborhood, inspired by the successful work of Geoffrey Canada and the Harlem Children’s Zone, is partnering with families, schools and other providers to build a strong academic “pipeline” of programs and services, and a strong future for this important neighborhood to Cleveland. The goal of the initiative is to ensure every child in Central is ready for school, goes to good schools, and graduates from high school and goes on to college or other training then on to a career. Prior to joining the foundation and Promise, Pryor-Jones founded Synchronicity Consulting LLC, an education and organizational development consultancy that has worked with organizations such as the Cleveland Public Library and MAYA Design, Inc. The Cleveland Central Promise Neighborhood partnership is working to receive a Promise Neighborhoods grant from the U.S. Dept. of Education. The application for a Promise Neighborhood implementation grant was due July 27. The foundation applied last year as well. The DOE funded the top five scoring applicants. But Cleveland finished sixth, one spot out of the money, scoring 0.33 points behind the fifth place applicant, losing out on $15 million. The foundation is also collaborating with Cuyahoga Metropolitan Housing Authority, which recently received a Choice Neighborhoods grant from the U.S. Dept. of Housing and Urban Development. Promise and Choice are complimentary federal programs focused on turning around distressed neighborhoods, with Choice focused primarily on the physical transformation of a neighborhood, and Promise on the educational and social transformation. The Promise Neighborhood ¯ stretching from Euclid to Woodland avenues, from East 22nd to East 55th streets ¯ is an area of contrasts. The three elementary schools in the area are in academic emergency, 80 percent of the children live in poverty. The neighborhood has the greatest share of people living in public or publicly subsidized housing in the area. But there’s also a community college, a state university, a hospital, and numerous churches, and businesses in that area too. 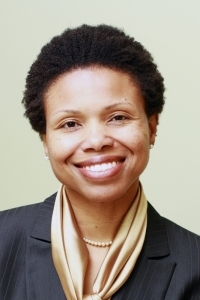 Prior to starting her own consulting company, Pryor-Jones was the executive director of the Metropolitan Cleveland Consortium for Science, Technology, Engineering, and Math at Case Western Reserve University, the regional hub for the Ohio STEM Learning Network. The public-private partnership was established to promote and amplify STEM education in Northeast Ohio. While executive director, Pryor-Jones secured over $3.5 million in funds, led the design and opening of two new Cleveland Metropolitan School District high schools, and provided support to over a dozen schools and out-of-school STEM programs. She also managed the establishment of the MIT (Massachusetts Institute of Technology) Mobile Fab Lab 2.0 ¯ a small-scale workshop equipped with computer-controlled tools and equipment that allows students the ability to design "almost anything." The mobile lab travels to local schools with the recent support of KeyBank. Pryor- Jones is a graduate of Kenyon College and has a Master’s in Education from Cleveland State University. Joan Mazzolini is communications director for the Sisters of Charity Foundation.